For those who teach that those who are in Christ do not experience hardship are ignoring the teaching of Jesus and the New Testament writers about the subject. Becoming a Christian does not make life easier; in some ways it makes even more challenging. No one is exempt from crisis-pain and suffering. All of us will go through either one or many. Some of you have gone through it. Some are about to go through it and others are in the midst of it. But don't lose hope. You have heard it said, "the only constant in this world is change." If this is true, then pain and crisis will change; they are seasonal in the seasons of life. They are are periodic in the period of one's life. They will pass. Have you forgotten that life is a journey? At times you go through smooth road. Sometimes you have to go through rugged trails. Sometime you've got to climb mountains and cross rivers. Whatever challenges you are facing in the journey, you must move on because life moves on without you. You can't afford to lose hope till the journey is over. All of us go through painful experiences in life. We go through deep waters. We go through dark tunnels. We go through deep valleys. It doesn't matter what they may be; it matters that we come out victorious. I have not understood pain as I know today had I not gone through one. I would have never learned how to cope with pain had I not been through one. My reminder for you is to see the bright side of your pain, because there is a purpose behind it. 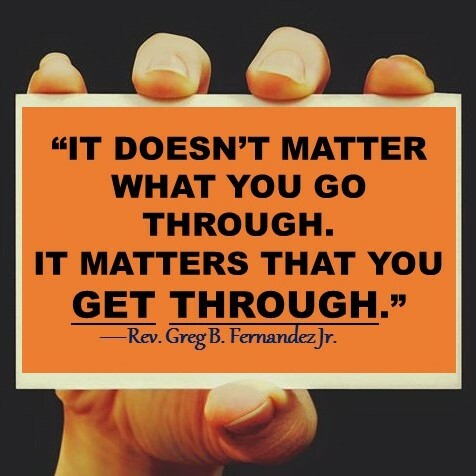 Remember it doesn't matter what you go through; it matters that you get through. It doesn't matter what you are going through; it matters that you will come out and never be a victim of your pain and current circumstances.